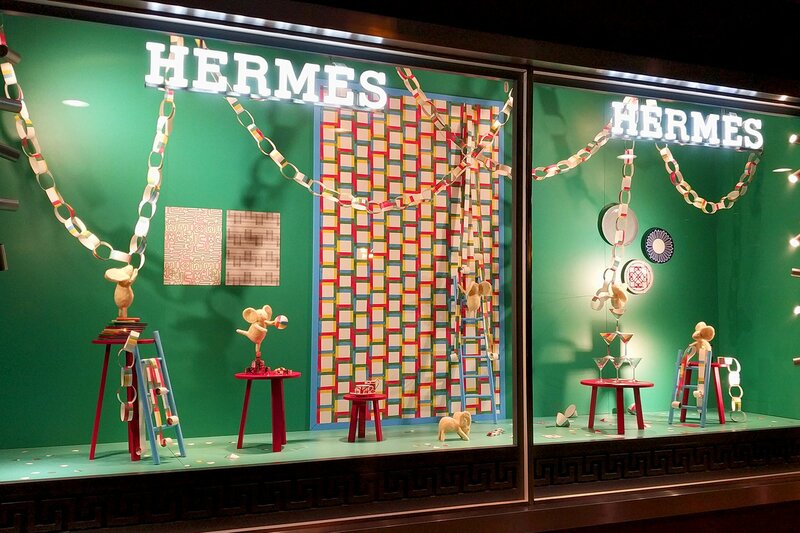 Hermès Spain celebrates the arrival of Christmas and does so with colorful windows and movement with the Dutch designer Kiki Van Eijk shows us the “art de vivre”. Many small mice made in wool by the artist have sneaked into the windows displays of the boutiques of Madrid, Barcelona and Marbella creating fun scenes in which Hermès products are presented as toys in their hands. 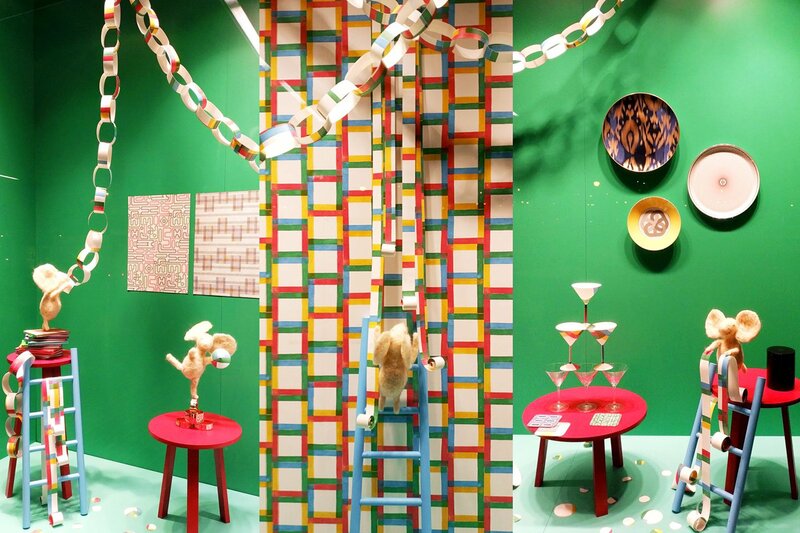 The production and installation of the elements that make up each windows displays have been made by INSTORE following the designs of Kiki Van Eijk, 2D and 3D production of furniture and decorative accessories used to show the new season products of Hermès. Each windows displays of Hermès Spain represents the different departments of the brand, the products are part of the scene and come to life. We can start talking about women’s leather goods; bags, keyrings and wallets that participate in a lively party of mice dancing with turntable included. Both the table and the turntable itself combine carpentry work with real elements. A decoration of carpentry and metal works with 3D production in which the installation and placement of the product was the key. 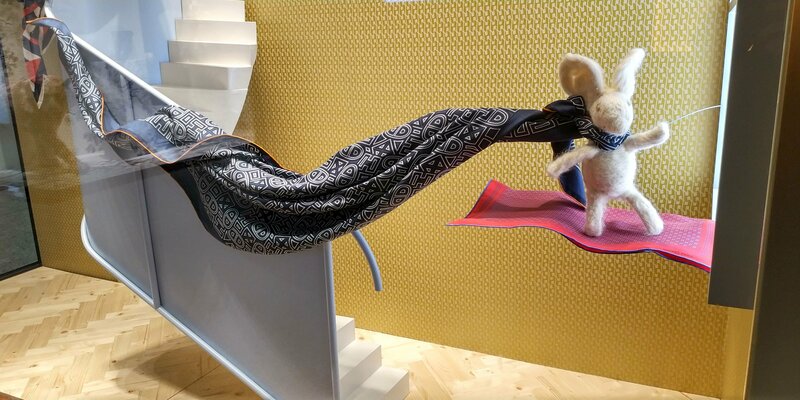 To give life to woolen mice flying among scarfs, creating the movement was essential to achieve the ones that the artist had imagined. 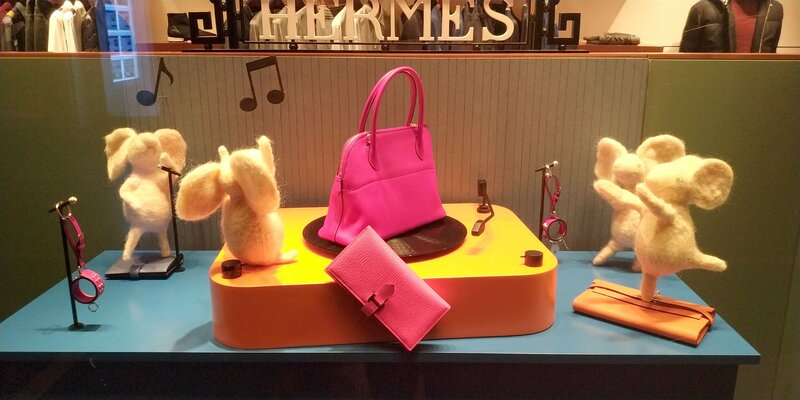 A third windows displays tells us about Hermès ceramics and presents its collection of horn jewellery. A tea with Christmas cakes is the perfect setting in which mice enjoy their particular afternoon tea. As in the others windows displays, it was necessary to create carpentry furniture and get some pieces that complement the decoration of the scene. 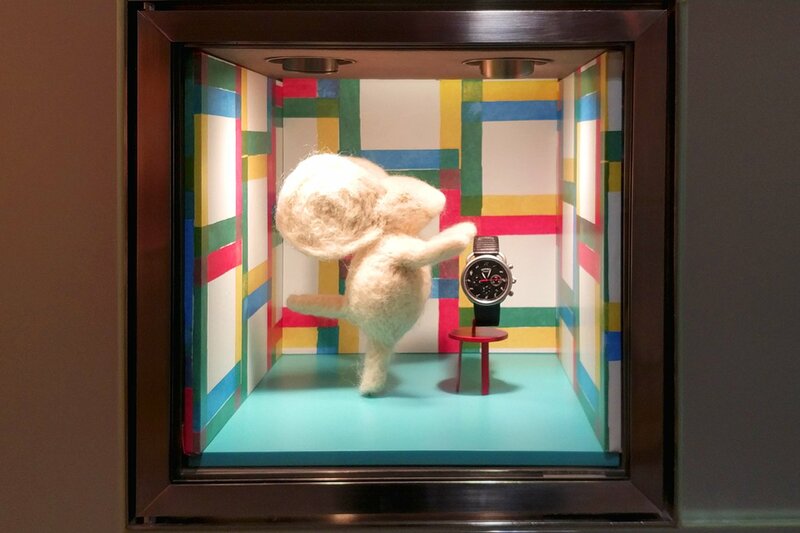 The women’s jewellery is also presented in these Christmas windows, in an animated and fun way. A night table becomes in a mini pool is the perfect place for Hermès Spain to show their latest designs. The jewelleries box that complement some of the windows displays are mini scenarios where a specific piece is presented as part of the game that Kiki Van Eijk designs for Christmas. 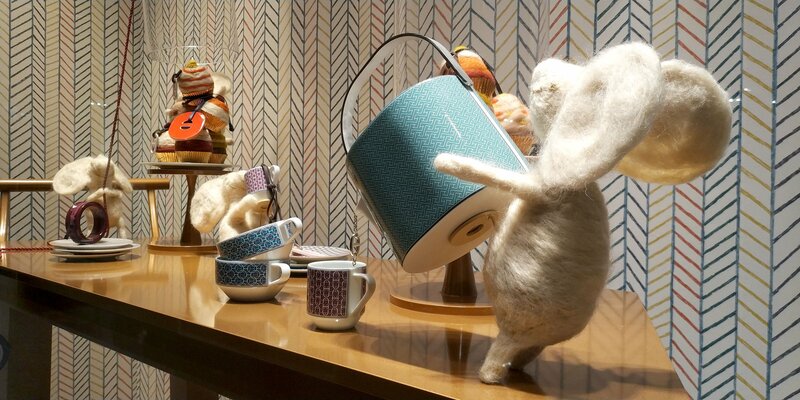 Finally we can highlight the windows that closes the series; dedicated to the “art de vivre”, this windows follows the thread of the party of mice with a common element, the design wallpaper of Hermès. In all the created spaces the wallpaper has served to cover backs and to manufacture different pieces used in decoration. 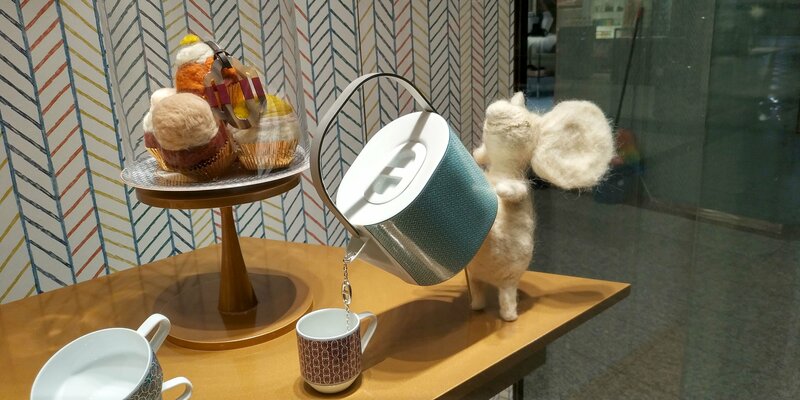 In this windows the use of wallpaper is even more evident, it serves to create garlans, placemats and paper glasses. 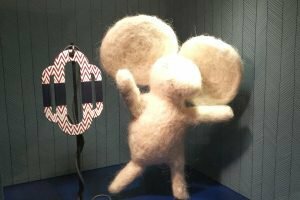 An article by Hermès for its more faithful customers than Hermès Spain wanted to stand out in the 2018 Christmas windows displays.